If you can’t compost outdoors, vermicomposting is your answer! 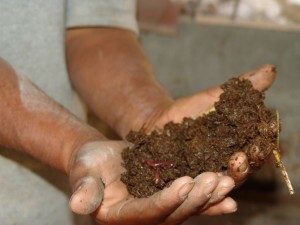 Vermicomposting uses Red Wriggler worms to convert food waste and organic material into a nutrient-rich natural fertilizer that you can use in many different ways. It is worm manure or worm poo, but it is also a fun way to learn about how waste can be turned into a valuable resource! It can be done indoors! It’s especially great for apartment-dwellers and others who don’t have space outdoors. 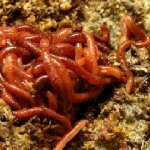 It happens fast as red wriggler worms can eat about half their own body weight in food per day. It does not smell if it is done properly. Worm compost is an excellent natural fertilizer that is even richer in nutrients than outdoor compost. A little worm “poo” goes a long way! First you will need to make or purchase a composting bin. There are several options to choose from depending on your needs. Then you need to purchase some red wriggler worms. These worms are different from your garden variety earthworm. They can consume and process large amounts of organic material in a relatively short time, they reproduce quickly under the right conditions, and are very happy to live in a small container. You cannot vermicompost with garden earthworms, you need red wrigglers. We recommend purchasing at least 1/2 lb of Red Wriggler worms to start with. Saskatoon, Saskatchewan – Contact Sandra Rose at 306-280-0674 or 306-477-0335 or e-mail ecomunchers@live.com. Full ad on Kijiji Saskatoon. Shipping offered year-round. Call, text, or email for a quote. There are also a number of on-line sites where you can purchase Red Wrigglers. Red Wriggler are most productive at room temperature. Exposure to hot sunny conditions or temperatures below 10° C should be avoided, as your worms can die in extreme temperatures. Keeping your worms indoors year round is likely your best option. Keep your bin somewhere that is easy to access like under the kitchen sink, in a bathroom, closet, basement, or in the garage (only in summer unless it is heated). Place you bin on a tray or in another bin to collect any excess liquid that might drip out through the bottom. Moisture from the tray can be drained outside or dilute with 10 parts water to feed your plants (indoors or out). 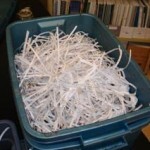 Before you can put your worms in your bin you need to provide them with some moist bedding material such as shredded newspaper and computer paper. Glossy paper like flyers or magazines should not be used. The bedding should be about as wet as a wrung-out sponge: not soggy, but not dry. You can easily wet down your bedding as you add it using a spray bottle. The bedding helps to regulate moisture and provides a medium in which your worms can live. Your worms should be covered with a layer of bedding at all times. Don’t pack it down as red wrigglers like loose bedding as they don’t burrow as well as garden earthworms. When you first start your bin you can add a handful of soil or sand just to help things get started. Red wriggler worms are vegetarians. While they can eat most foods that you would put in an outdoor compost bin, there are some important differences. Foods like citrus peels and coffee grounds can make the bin acidic and should only be added in moderation. Crushed or finely ground egg shells will help control acidity and also provide the worms with valuable nutrition. It is best to collect your worm food in a container and feed your worms once or twice a week. To help break the food down more quickly, you should cut or chop it into small pieces. Storing food in the freezer also helps break it down and reduces any odours from the stored food. Always thaw the food before feeding your worms. To feed your worms, simply bury the food under the bedding and/or the worm manure/castings. (Yes it is worm poo!) Always rotate or move around the bin choosing a different location every time you feed the worms. This will help to keep the decomposed materials and fresh food scraps separate. It’s a good idea to make yourself a plan to follow and mark where you placed the food last. By the time you get back to the first position most of the food should be at least partially composted. When you have placed the new food in the bin remember to cover it up again with both worm castings and bedding material. Feeding in this manner, will help you monitor how much the worms are eating and help you regulate how often you feed them as well. It will make it easier to harvest the finished worm compost when it is ready. Avoid over-feeding your worms as this can result in unpleasant odours and attract fruit flies. If you notice that there is still a significant amount of food in your bin, simply wait a few days and check it again. There is not a lot to do other than feed the worms and harvest your free compost, however because your worms’ skin needs to be moist to allow them to “breathe,” you have to keep an eye on the moisture content in the bin. If it is too dry, the worms will not do their job and can even die. If it’s too wet, the worms can drown and your bin can begin to smell. Making holes in the bottom of your worm bin will help to keep the bin from getting too wet, but you still need to check it as these regularly. If the bin is too dry you can use a spray bottle to dampen the bedding until it is as wet as a wrung-out sponge. If the bin seems too wet, you can add additional dry bedding to help absorb the extra moisture. There are several different options for harvesting your finished vermicompost and lots of different ways to use it. For more information click here! Complete the notification form to find out when is our next vermicomposting presentation.